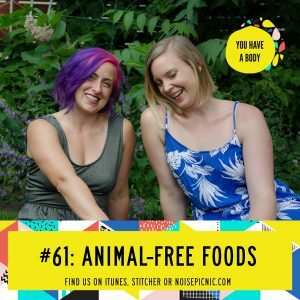 This week Hannah and Lucia talk about different types of foods that are decidedly animal-free (listen back to dairy-free from last week to catch up!). What does this mean? Vegan, of course! Listen on to hear some of the reasoning behind why certain ingredients are added to different vegan food fare, how to consider choosing foods from a non-processed vantage point to always be supporting your health. Humans, especially us modern ones, have soooo many dietary options to choose from that it’s pretty staggering these days to find out what’s optimal for you! But don’t fret yet, because Lucia and Hannah give you some easy metrics to follow to get yourself feeling groovy, happy and healthier. Like what you’re hearing? Great! Leave us a review in iTunes and we’ll send a personal shout out on an upcoming episode to you!